The Christmas records were recently forklifted out of the WFMU pit and put into the record library. Well, not that recently - they've actually been out since last July. (Program Director Brian is on the Committee to Reclaim Ownership of Christmas.) Fortunately, most of our DJs are able to resist the powerfull pull of Christmas music until the blessed day is a little closer. 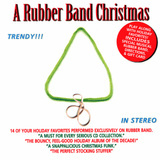 But there's one Xmas CD that's become close to my heart, if ony because I love office supplies so damn much - A Rubber Band Christmas. Perhaps by posting these here, I'll be better able to resist the urge to play them on the air. Thanks. This is the perfect christmas present for my friend who has "everything". Any chance of getting the instructions for rubberband playing that came with the record? The fastest way to play your own songs and but the crap out of everyone you talk to this week, is to wrap a rubberband around your phone reciever and start plucking away. TRY THIS: Don't tell the person you are calling that your doing this! Pretend you don't here it.